There’s an old saying that “good things come in small packages.” And this definitely rings true in the case of decorating a small bedroom. While the limited floor space might pose some challenges, the decorating possibilities that the room provides is unbounded. It’s just a matter of using one’s imagination, a little elbow grease and, at times, finding new uses for old things. So if you’re stuck with a small bedroom, and you’re starting to lament over its looks, here are five steps to spiff it up and turn it into a dreamy retreat. 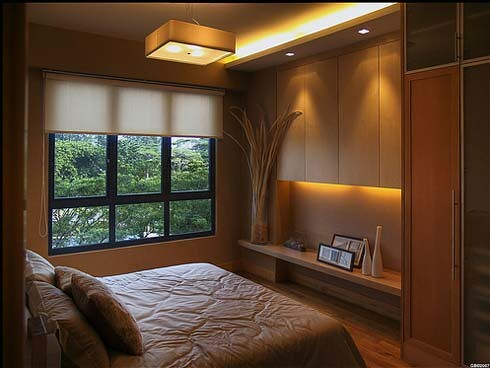 Like any room in your home, your bedroom needs a focal point, an attention-grabbing spot where the eyes can rest upon. All too often, the wall behind the bed serves as the focal point of the bedroom. But, in a particularly small space like yours, you can make the windows the center of the space’s attention as well. Or, better yet, meld these two visually interesting spots by placing the bed near the windows. This way, they don’t compete for attention and make the room feel cozier. You might be tempted to purchase the biggest bed to create a more cozy sleeping nest and large side table and seat to comfortably accommodate you while you read or do your paperwork. However, furnishing your small bedroom with large pieces will only make the space feel cramped. Instead, choose furniture whose stature is appropriate for the scale of your bedroom or pieces that won’t eat up a lot of floor space. 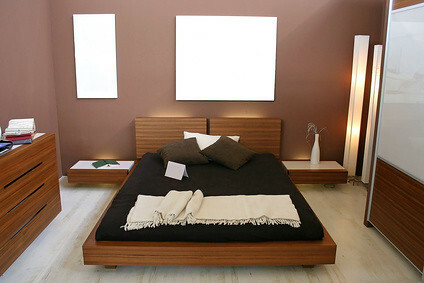 For instance, a bed with low, see-through or no footboard will make the center of the room appear more spacious. You have two options when it comes to coloring your small bedroom. If you want to pump up its coziness, then you can paint its wall with darker tones like chocolate browns. However, if you want to open up the space, make it look larger than it actually is, and boost the amount of light inside, consider using light-bouncing or vibrant shades, such as sunshine yellow, turquoise or cool green. In a tight bedroom, every square inch counts. So if you want better function from your tiny bedroom, consider outfitting it with space-saving storage solutions. For instance, you can install hanging shelves on a tight corner and use them to hold your books and other collection. A storage ottoman at the foot of your bed or under the window can do double duty of holding extra bedding when not in use. Let your bedroom reflect your personality by accentuating it with punchy, patterned fabrics. You can also make a statement by grouping together your favorite items, like a framed snapshots, shell collection, etc. Remember, this is your bedroom. No matter how small it can be, you need to decorate it with things that make you happy. This home improvement advice was penned by Ericka for UK-based company, Ace Blocks www.aceblocks.co.uk Ericka is an avid writer and has contributed helpful articles about gardening and home improvement on different websites.